In accordance with the first subparagraph of Article 8(2) of Regulation (EC) No 509/2006, and pursuant to Article 19(3) of the same Regulation, the application by Italy for registration of the name ‘Pizza Napoletana’ was published in the Official Journal of the European Union (2). Germany and Poland lodged statements of objection to the registration under Article 9(1) of Regulation (EC) No 509/2006. Those objections were deemed admissible under Article 9(3)(a) of that Regulation. Germany’s statement of objection concerned, inter alia, the fear that German wheat flour is put at a disadvantage, considering that only one type of wheat flour, available in one Member State, namely Italy, is authorised pursuant to the product specification. Poland’s statement of objection concerned, inter alia, the fact that the name is not specific in itself and the application for registration as published does not contain appropriate explanations. By letters dated 17 September 2008, the Commission asked the Member States concerned to seek agreement among themselves in accordance with their internal procedures. An agreement, notified to the Commission on 24 February 2009 and endorsed by it, was concluded between Italy and Germany within six months. Under that agreement, the restrictions associated with the use of certain wheat flour were lifted. Given that no agreement was reached between Italy and Poland within the prescribed period, however, the Commission is required to take a decision in accordance with the procedure referred to in Article 18(2) of Regulation (EC) No 509/2006. In that context and as a result of Poland's objection, explanations to show that the name for which registration is sought is specific in itself were added to the product specification. In the light of those considerations, the name ‘Pizza Napoletana’ must therefore be entered in the ‘Register of traditional specialities guaranteed’. The protection referred to in Article 13(2) of Regulation (EC) No 509/2006 has not been requested. The name referred to in Annex I to this Regulation shall be entered in the register. The consolidated product specification is set out in Annex II to this Regulation. Done at Brussels, 4 February 2010. (1) OJ L 93, 31.3.2006, p. 1. (2) OJ C 40, 14.2.2008, p. 17. Registration is applied for solely in the Italian language. The words ‘Prodotta secondo la Tradizione napoletana’ (Produced in the Neapolitan tradition) and the acronym STG (TSG) which feature in/on the logo/label of ‘Pizza Napoletana’ TSG are translated into the language of the country where production took place. The name ‘Pizza Napoletana’ is traditionally used to designate this product, as attested to by the various sources stated in point 3.8. ‘Pizza Napoletana’ TSG is a round product baked in the oven with a variable diameter not exceeding 35 cm and a raised rim and the central part is garnished. The central part is 0,4 cm thick, with a tolerance of ± 10 %, and the rim is 1-2 cm thick. The overall pizza must be tender, elastic and easily foldable into four. ‘Pizza Napoletana’ TSG is distinguished by a raised rim, a golden colour characteristic of products baked in the oven, and a tenderness to touch and to taste; by a garnished centre dominated by the red of the tomatoes, perfectly mixed with oil and, depending on the ingredients used, the green of the oregano and the white of the garlic; by the white of the mozzarella slabs which are laid either closer together or further apart, and the green of the basil leaves, which are lighter or darker depending on the baking. The consistency of ‘Pizza Napoletana’ must be tender, elastic and easily foldable; the product is easy to cut; it has a characteristic, savoury taste given by the raised rim, which has a taste typical of bread which has risen and been baked well, mixed with the acidic flavour of the tomatoes and the aroma of the oregano, garlic and basil and the flavour of baked mozzarella. At the end of the baking process the pizza emits a characteristic aroma which is deliciously fragrant; the tomatoes, which have lost only their excess water, remain compact and solid; the ‘Mozzarella di Bufala Campana AOP’ or ‘Mozzarella STG’ are melted on the surface of the pizza; the basil, garlic and oregano develop an intense aroma and do not look burnt. The basic raw materials distinguishing ‘Pizza Napoletana’ are: common wheat flour, brewer’s yeast, drinkable natural water, peeled tomatoes and/or small fresh tomatoes (‘pomodorini’), sea salt or kitchen salt and extra virgin olive oil. Other ingredients which may be used in the preparation of ‘Pizza Napoletana’ are: garlic and oregano; ‘Mozzarella di Bufala Campana AOP’, fresh basil and ‘Mozzarella STG’. The preparation of ‘Pizza Napoletana’ exclusively comprises the phases of work described below, to be carried out in a continuous cycle on the same commercial premises. Blend the flour, water, salt and yeast. Pour a litre of water into the dough kneader, dissolve in a quantity of between 50 and 55 g of sea salt, add 10 % of the prescribed total quantity of flour, then add 3 g of brewer’s yeast. Start up the dough kneader and gradually add 1,8 kg of W 220-380 flour until the desired consistency is reached, which is defined as the ‘dough point’. This operation should take 10 minutes. The dough must be worked in a dough kneader, preferably one with a dough hook, for 20 minutes at low speed, until a single compact mass is obtained. The quantity of water that flour is capable of absorbing is very important in obtaining an optimum dough consistency. The dough must not be sticky to the touch and must be soft and elastic. First stage: once it has been removed from the dough kneader, the dough is placed on a work surface in the pizzeria where it must be left for two hours, covered with a damp cloth, to prevent its surface from hardening and a type of crust from forming as a result of the evaporation of the internal moisture. Once the two hours for rising have passed, the next stage is the shaping of the dough balls, which must be carried out exclusively by hand by the pizza chef. Using a spatula, a portion of the risen dough is cut off on the work surface before being shaped into a ball. For ‘Pizza Napoletana’, the dough balls must weigh between 180 and 250 g.
Second stage: once the dough balls have been shaped, a second rising phase lasting four to six hours takes place inside food containers. This dough, which is kept at room temperature, is ready to be used within the next six hours. Once the dough has risen, the dough ball is taken out of the box using a spatula and is placed on the counter of the pizzeria on a light layer of flour to stop it sticking to the work surface. Working from the centre outwards, and by exerting pressure with the fingers of both hands on the dough ball, which is turned over several times, the pizza chef shapes a disc of dough whose thickness must not exceed 0,4 cm in the centre, with a tolerance of ± 10 %, and 1 to 2 cm on the edges, thus forming a raised rim. No other type of preparation is authorised for the preparation of ‘Pizza Napoletana’ TSG, in particular the use of a rolling pin and/or a mechanical press-type disc machine. using an oil dispenser with a spout and a spiralling motion, distribute over the surface area, from the centre outwards, 4 to 5 g of extra virgin olive oil, with a tolerance of + 20 %. Using a little flour and a rotating movement, the ‘pizzaiolo’ (pizza chef) transfers the garnished pizza onto a wooden (or aluminium) baker’s peel and slides it onto the cooking floor of the oven with a quick flick of the wrist, which prevents the garnish from running. The ‘Pizza Napoletana’ TSG is baked exclusively in wood-fired ovens with a baking temperature of 485 °C, which is essential for producing the ‘Pizza Napoletana’ TSG. The pizza chef must monitor the baking of the pizza by lifting its side using a metal peel and rotating the pizza towards the fire, taking care always to use the same initial area of the cooking floor to ensure that the pizza does not burn due to differences in temperatures. It is important that the pizza is baked uniformly across its entire circumference. Still using the metal peel, when baking is finished, the pizza chef removes the pizza from the oven and places it on the plate. The baking time must not exceed 60 to 90 seconds. After baking, the pizza has the following characteristics: the tomatoes, having lost only their excess water, remain compact and solid; the ‘Mozzarella di Bufala Campana AOP’ or ‘Mozzarella STG’ are melted on the surface of the pizza; the basil, garlic and oregano emit an intense aroma and do not look burnt. The ‘Pizza Napoletana’ should preferably be consumed immediately, as soon as it comes out of the oven, in the same location as it was produced. However, if it is not consumed at the place of its production, it cannot be frozen or deep frozen or vacuum packed for later sale. There are numerous key elements defining the specific character of the product in question and they are directly linked to the duration and methods used in the operations, and also to the skill and experience of the artisan. In particular, the preparation process for the ‘Pizza Napoletana’ is characterised by: kneading, the consistency and elasticity of the dough (‘reologia’) and the specific nature of the rising process (in two phases with specific conditions regarding temperature and duration); preparation and shaping of the dough balls; the handling and preparation of the risen disc of dough; the preparation of the oven and the baking characteristics (duration/temperatures) and the specific characteristics of the oven which must be fired exclusively by wood. For example, the importance should be stressed of the second rising, handling and work equipment, i.e. the oven, which must be a wood-fired oven, and the peels. After the second rising, the dough ball has grown in volume and moisture in comparison with the previous period. The pressure exerted by the fingers of both hands causes the air contained in the pockets of the dough to move from the centre to the edges of the disc of dough, where it starts to form the raised rim of the pizza. This technique constitutes a fundamental characteristic of the ‘Pizza Napoletana’ TSG, with the rising of the rims of the disc ensuring that all the ingredients in the garnish are retained. In order to increase the diameter of the dough ball, preparation is continued by throwing the dough between the hands, holding the right hand at an angle of 45-60° to the work surface, placing the disc of dough on it and turning it with a synchronised movement of the left hand. In contrast, other types of preparation, in particular those carried out using a rolling pin or a disc machine (mechanical press-type) do not succeed in homogenously displacing the air in the pockets present in the mass towards the edges, and this is necessary to produce a disc of dough which is uniform across all its parts. They lead to the formation of an area of dough in the centre of the disc which is layered and divided by the air in the void. Consequently, if these instruments are used, after baking the pizza will not have its typical raised rim, which is one of the main characteristics of the ‘Pizza Napoletana’ TSG. Furthermore, the Neapolitan technique requires the pizza chef, after having prepared a series of three to six discs of garnished dough, to skilfully slide the pizza from the work surface to the peel using precise and rapid hand movements, and ensuring that the pizza does not lose its initial round shape (the pizza is taken in both hands by the pizza chef who, by turning it round approximately 90°, places it on a suitable peel). The pizza chef sprinkles a little flour on the peel going into the oven to enable the pizza to slide easily from the peel into the oven. This operation is carried out with a rapid flick of the wrist, by holding the peel at an angle of 20-25° to the oven surface, and by ensuring that the garnish does not fall from the surface of the pizza. The use of techniques other than those described above is not appropriate, since taking the pizza directly from the work surface using the peel risks spoiling the pizza which is ready to go into the oven. The wood-fired oven is a key element in the baking and the quality of the ‘Pizza Napoletana’. Its technical characteristics are essential to the success of the traditional ‘Pizza Napoletana’. The ‘Pizza Napoletana’ oven consists of a base of tuff bricks surmounted by a circular surface known as a ‘sole’ (cooking floor), on top of which is built a dome. The dome of the oven is made of refractory material to prevent the heat from dispersing. Indeed, the ratios between the different parts of the oven are essential for ensuring that the pizza is baked well. The particular characteristic of this oven is the size of the cooking floor, which is made up of four refractory circular areas. The pizza chef picks up the pizza with the steel and/or aluminium peel and puts it in the mouth of the oven, where he deposits it and turns it around 180°. The pizza is then placed back in its initial position, the temperature of the base having been reduced as the pizza absorbs the heat as it cooks. Positioning the pizza in a different place would have the effect of obtaining the same initial temperature, which would burn the base of the pizza. All these specific characteristics create the phenomena of the air chamber and the appearance of the final product, the ‘Pizza Napoletana’, which is indeed soft and compact; has a raised rim, is raised in the centre, is particularly soft and easily foldable into four. It is important to stress that all other similar products obtained using preparation processes different to that described cannot obtain the same visual and organoleleptic characteristics as those of the ‘Pizza Napoletana’. The first appearance of the ‘Pizza Napoletana’ may be dated back to the period between 1715 and 1725. Vincenzo Corrado, a native of the town of Oria, and chief cook for Prince Emanuele di Francavilla, in a treatise on the foodstuffs most commonly used in Naples, stated that the tomato was used to season pizza and macaroni, thereby associating two products which have been the source of the fame of the city of Naples and the reason for its inclusion in the history of gastronomy. This quotation marks the official birth of the ‘Pizza Napoletana’, a disc of dough seasoned with tomato. A great number of historical documents attest to the Neapolitan origin of this culinary speciality. The writer Franco Salerno claimed that this product was one of the greatest inventions of Neapolitan cooking. Even Italian-language dictionaries and the encyclopaedia Treccani expressly mention the ‘Pizza Napoletana’. The expression ‘Pizza Napoletana’ is also quoted in numerous literary texts. There is no doubt that the first ‘pizzerie’ (pizzerias) appeared in Naples where, until the middle of the twentieth century, this product was exclusive to the city and its pizzerias. In the eighteenth century, the city already had several shops known as ‘pizzerias’. The King of Naples, Ferdinand of Bourbon, heard of their reputation and, in order to taste this dish in the typical Neapolitan tradition, breached court etiquette and visited one of the most renowned pizzerias. Since then the ‘pizzeria’ has become a fashionable location, a place devoted to the exclusive preparation of the ‘pizza’. The most popular and famous pizzas from Naples were the ‘Marinara’, created in 1734, and the ‘Margherita’, which dates from 1796-1810. The latter was presented to the Queen of Italy upon her visit to Naples in 1889, specifically on account of the colour of its seasoning (tomato, mozzarella and basil) which are reminiscent of the colours of the Italian flag. Over time pizzerias appeared in every town in Italy and even abroad. However each of them, despite being located in a town other than Naples, has always linked its existence with the words ‘pizzeria napoletana’, or used a term which in some way evokes its link with Naples, where for more than 300 years this product has retained its authenticity. In May 1984 the ‘pizzaioli napoletani’ drew up a brief product specification which was signed by the whole profession and registered by means of an official document witnessed by the notary Antonio Carannante of Naples. Over the centuries the term ‘Pizza Napoletana’ has become so widespread that everywhere, including outside Europe in Central and South America (e.g. Mexico and Guatemala) and Asia (e.g. Thailand and Malaysia), the product in question is known by its name ‘Pizza Napoletana’, although the inhabitants sometimes do not have the slightest idea of the geographical location of the city of Naples. In businesses, during the kneading, rising and preparation phase of the dough, checking the correct execution of the phases described; carefully monitoring the critical points of the business; checking the compliance of the raw materials with the product specification; checking the perfect conservation and storage of the raw materials to be used and ensuring that the characteristics of the final product are compliant with the specifications contained in the product specification. The acronym ‘STG’ (TSG) and the words ‘Specialità Tradizionale Garantita’ (Traditional Speciality Guaranteed) and ‘Prodotta secondo la Tradizione napoletana’ (Produced in the Neapolitan tradition) are translated into the official languages of the country where production took place. The logo which distinguishes the ‘Pizza Napoletana’ is as follows: a horizontal white oval image with a light grey border, which represents the plate on which the pizza is presented, reproduced in a realistic but stylised manner, fully respecting the tradition and illustrating the classic ingredients, tomato, mozzarella, basil leaves and a trickle of olive oil. Under the plate there is an offset green shadow, which, in combination with the other colours, emphasizes the Italian colours of the product. Slightly superimposed above the plate containing the pizza, there is a red rectangular window with very rounded corners containing the words in white surrounded by black, with an offset green shadow with a white border: ‘PIZZA NAPOLETANA STG’. Above this caption, and slightly to the right, in smaller white characters of a different type, features the caption ‘Traditional Speciality Guaranteed’ (Specialità Tradizionale Garantita). 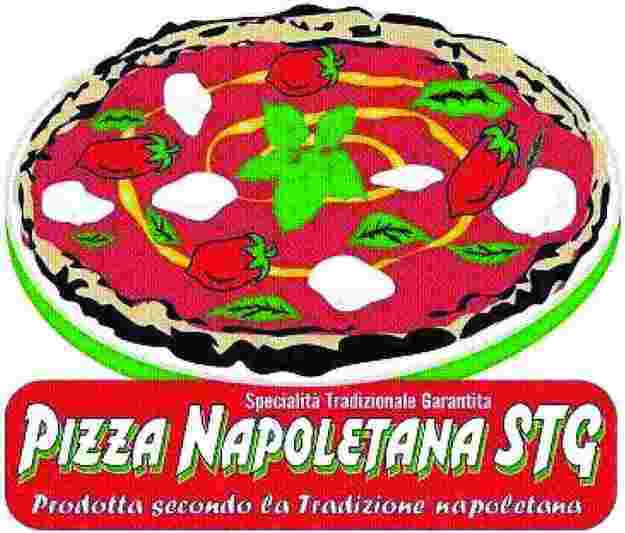 Below, in the centre, in the same characters as the logo, PIZZA NAPOLETANA STG, in small capital letters in white with a black border, is superimposed the caption: ‘Produced in the Neapolitan tradition’ (Prodotta secondo la Tradizione napoletana). The three inspection bodies above are responsible for carrying out checks on various subjects in different parts of the national territory.